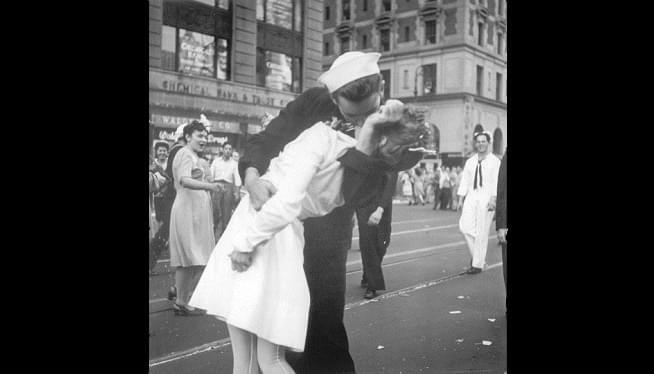 PROVIDENCE, R.I. — The ecstatic sailor shown kissing a woman in Times Square celebrating the end of World War II died Sunday. George Mendonsa was 95. Mendonsa was shown kissing Greta Zimmer Friedman, a dental assistant in a nurse’s uniform, on Aug. 14, 1945. Known as V-J Day, it was the day Japan surrendered to the United States. People spilled into the New York City streets to celebrate the news. Several people later claimed to be the kissing couple. It was years before Mendonsa and Friedman were confirmed to be the couple. Mendonsa served on a destroyer during the war and was on leave when the end of the war was announced. He has said Friedman reminded him of nurses on a hospital ship that he saw care for wounded sailors.